With an advanced GPS system and a high resolution display The forerunner is worth every penny it would cost you. The Forerunner 220 is a premium GPS Running watch by Garmin; a household name in the GPS industry. It features a high resolution display exhibiting vivid colors and a comfortable, lightweight design. It also features simple button operations and a sturdy, hinged wristband that’s comfortable for wrists of any size. The Forerunner 220 measures essential running data including the distance covered, pace and heart rate of the runner. The unit is waterproof so that it doesn’t have problems with sweat or rain. It’s backed by a single lithium ion battery that gives a backup of about 10 hours. Coming at a hefty price of $ $249.99, the ForeRunner 220 is expensive but certainly worth it. The device is like a virtual coach. It keeps an eye on you, provides constant feedback and records all your stats so you can focus on your run. The devices monitors your pace, intensity and location using a GPS module. In addition to the GPS, the 220 has a built-in accelerometer. The accelerometer can record distance and pace data when you’re running on an indoor track or treadmill, without a need for a separate foot pod. The accelerometer can also track distances when GPS is unavailable or the connectivity is poor, such as when you run through a tunnel or training in an underground gym. Like all Garmin devices the Forerunner 220 is also compatible with free training plans from Garmin Connect, which you can schedule and install to your watch, for real-time coaching. 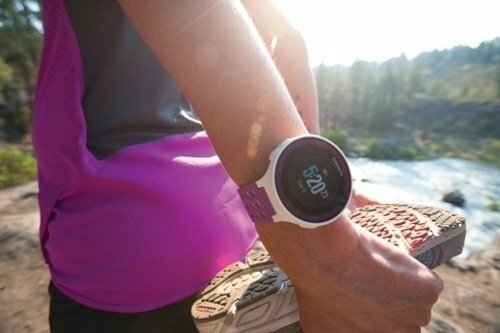 The Forrunner 220 is packed with a number of features like the Auto Pause, which allows the device to detect when you pause your run and stop too. When you start again, the device resumes the count. Besides that, it can also track the heart rate and allows the runner to set up alerts for heart rate, pace or run/walk intervals to help you stay in the desired range. It features vibration alerts and audible alerts, and you can customize it to provide both or just one type of prompt. When your run is complete and stats saved in your watch’s history, a summary of your session appears so you can see how you did. The 220 also notifies if you hit any personal records on that run, such as your fastest mile, 5k, 10k, half or full marathon, or your longest run to date. Just like any responsible coach, the Forerunner 220 provides you with motivating feedback you need to guide your training. 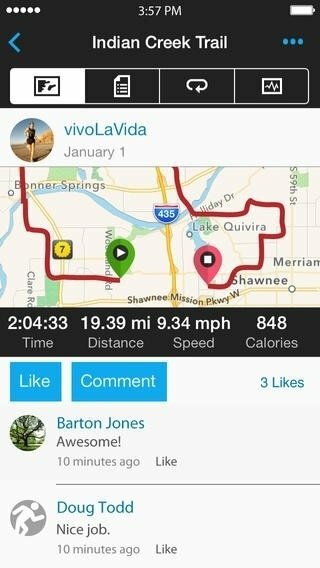 You can even get post-run appreciation from your friends and fans, using 220’s connected features like real-time live tracking and social media. Get the Garmin- Connect app on your smartphone and link it up with your device using Bluetooth. The app gives you further insights about your progress and guides you to make more efficient runs. By regularly connecting your watch to Garmin Connect, you’ll also benefit from a faster GPS fix due to the satellite data that will be sent to your device automatically. We have to say the GPS on this watch works really well even in areas where it is densely populated or with a lot of construction. It’s pretty accurate and reliable and the regular update fixes any problem that emerges. The display is highly user configurable with a variety of screens that you can choose to display data during your run. The unit is very easy to setup and the functions and buttons are pretty intuitive. We just wish more color combination were offered and the battery life was a bit better, other than that the FORERUNNER 220 is one of the best devices that we have tested.